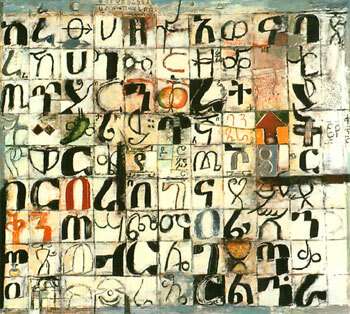 New York (Tadias) – For over two decades, Ethiopian-born artist Wosene Worke Kosrof has experimented with the aesthetic potential of language, using written Amharic as the major compositional element in his bold colored and textured works. 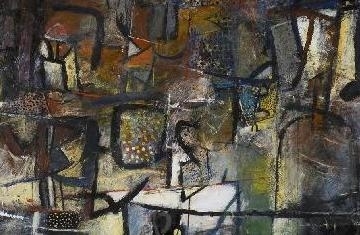 According to the artist’s website, in his paintings, the calligraphic forms of Amharic are broken apart, abstracted, and reconfigured to create a new visual language that draws upon the artist’s Ethiopian heritage while incorporating his experiences as an expatriate living in the United States. The Contemporary African Art Gallery in New York has been showing Kosrof’s work long enough to remember his early exploration in transforming these symbols into contemporary fine art. 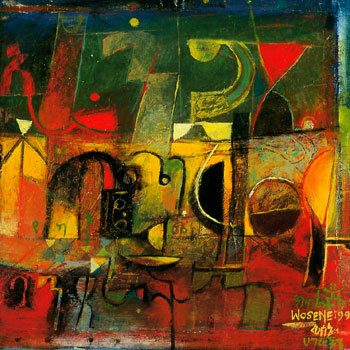 Word Play presents an evolved body of work that shows how Wosene employs these language characters as discrete script-images that move beyond his Ethiopian cultural boundaries to an international language. The gallery, owned and operated by Bill Karg & Reese Fayde, has extensive inventory and collection, which include works by the legendary Ethiopian artist the late Skunder Boghossian, among other notable African artists. Kosrof’s works have been collected by institutions as varied as the United Nations, the Volkerkunde Museum in Zurich, Switzerland and The National Museum of African Art at the Smithsonian, as well as many other domestic institutions and private art lovers. Opening reception is scheduled for Thursday May 1, 2008, 6:00-9:00pm. I will see you in New york sometime in the summer. We will get together for coffee then. What a beautiful art. I love it..keep it up Wosene! Wonderful art, what an inspiration. Keep up the good work. I am Proud of you! yesefere lij(arat kilo)! I have a pair of small paintings by you about medicine,which my father bought for me from your studio in Addis,in the 1970′s.I wonder if you remember them? I am curious.Can you e-mail me the image. Will love to see it. I am a friend of John Strawn, I recentley aquired a painting of your to offer to my husband on his birthday (Learning to write 2007)Love it! Please continue to write and I will try to paint. I will never forget a song that I heard on a radio station back in 1990 wherein the singer laments that African genius is buried in European museums. 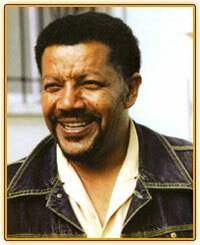 Well thankfully Wosene’s work can be readily appreciated by everyone.